New year, more of the same for Kevin Harvick. Harvick, who ran away with the 2006 Busch Series title, started the new season with a victory Saturday, his first at Daytona International Speedway. The Orbitz 300 was dominated by Buschwhackers _ Nextel Cup regulars moonlighting in the junior series _ and Harvick dominated in the last half of the 120-lap event. Harvick, who started 31st in the 43-car field, crossed the finish line about three lengths ahead of runner-up Dave Blaney, who gave Toyota a solid finish in its first Busch event. "I told them, I said if we ever get all the way to the front, we're going to be in really good shape," Harvick said. "Because the whole last run, once I got to the front, I never had to let off the floor." 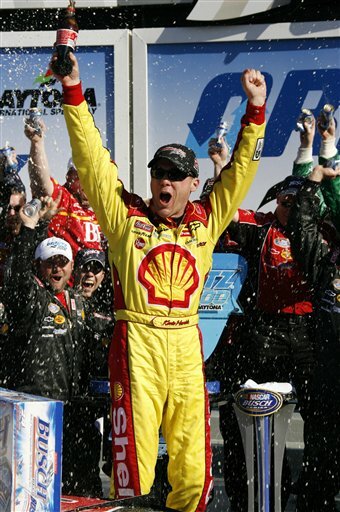 Harvick, who will start 13th in Sunday's Daytona 500, won nine races last year to earn his second Busch Series title. He beat runner-up Carl Edwards by 824 points last season. Even with only a partial Busch schedule planned this season, Harvick's win should come be no surprise _ he finished in the top eight, including a trio of runner-up finishes, in his nine previous Busch starts on the 2.5-mile Daytona oval. Still, Harvick's not considering adding more Busch races. "Absolutely not," he said. "We're here to win races, and it's something to where we just want to go out and hopefully keep going where we left off last year. This is a great team, great organization. "It's just a lot of fun to drive when the car is like that," Harvick added. Blaney, who will drive one of four new Toyotas in the 500, was involved in a multicar crash on the race's fourth lap but came away without much damage. "We just kind of hung around, hung around," he said. "And right at the very end I snuck into second." Blaney never challenged Harvick, who led the final 42 laps. "Kevin was handling a little bit better than I was, and I couldn't get to his back bumper," he said. Cup drivers finished in the top 12 spots, with Edwards third, followed by Clint Bowyer, Mark Martin, Martin Truex Jr., Dale Earnhardt Jr., Tony Stewart, Denny Hamlin, Greg Biffle, Robby Gordon and Matt Kenseth, all entered in Sunday's race. The top Busch regular was Scott Wimmer. Stewart, the 500 favorite after winning last Saturday night's Budweiser Shootout and a 150-mile qualifying race Thursday, saw his string of three straight wins in this race end. "I got three top 10s in a row, so I'll find the bright side to it," Stewart said. Kyle Busch, another Cup star, dominated the early part of the race, leading 46 laps before a fuel pressure problem ended his day. The two Indianapolis 500 winners in the field, both new to stock car racing, looked good for a while before encountering trouble. Juan Pablo Montoya, making the switch from Formula One to NASCAR and a starter in Sunday's Daytona 500, drove from 16th to fourth in the early going before his engine blew and relegated him to 40th. Sam Hornish Jr. was running in the top 20 before bouncing off the wall. He continued but wound up 31st.